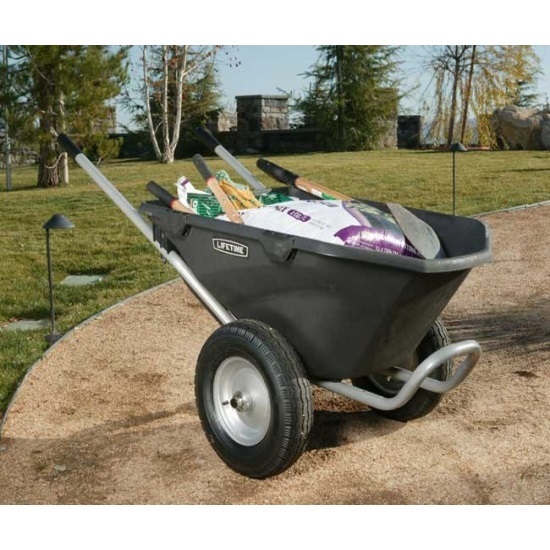 This uniquely designed wheel barrow from Lifetime Products will help you get your yard work done easier. The tub of this unit measures a whopping 6.5 cubic Ft, which holds up to 550 lbs. 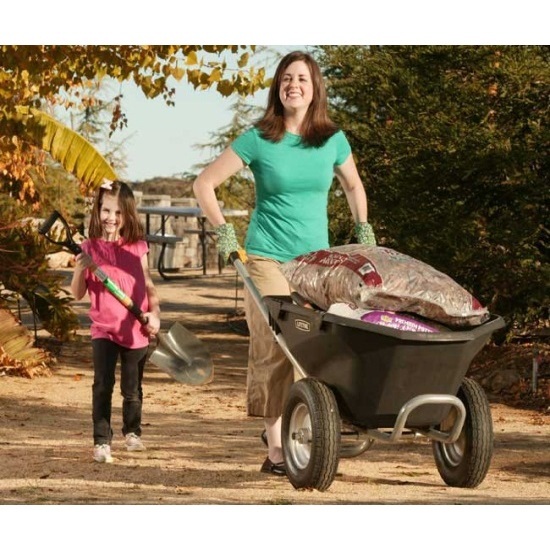 Help work in your local environment while protecting the whole environment with this Lifetime wheelbarrow, which is made from 100% post-consumer recycled material. 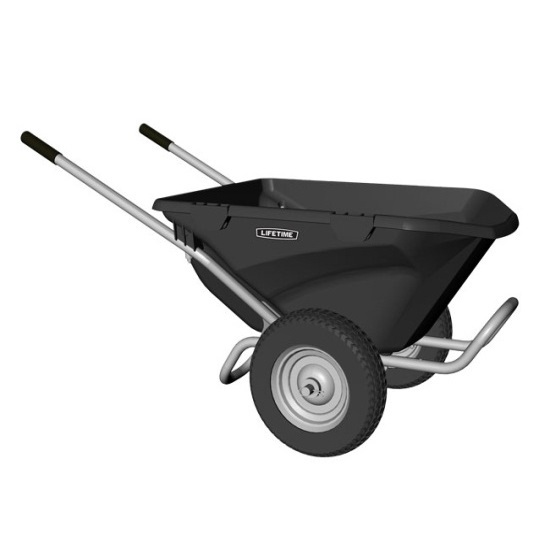 This unit has a wider wheel base than traditional wheelbarrows and a lower center of gravity, which provides greater stability when moving. The front of the tub portion is tapered, making it easier to dump loads. 6.5 cubic Ft. tub capacity. Designed to distribute 85% of the load weight to wheels, and only 15% to the operator. Tapered front of the tub for easier load dumps. Frame is powder coated steel to resist rusting. Total dimensions: 28 in. x 58 in. x 26 in. Tub Dimensions: 56 in. x 28.5 in. Tires specs: 15.5 in. pneumatic, 2 ply, powder-coated steel rims with metal bearing. Wheelbase is wide and the wheels are centralized for better stability. 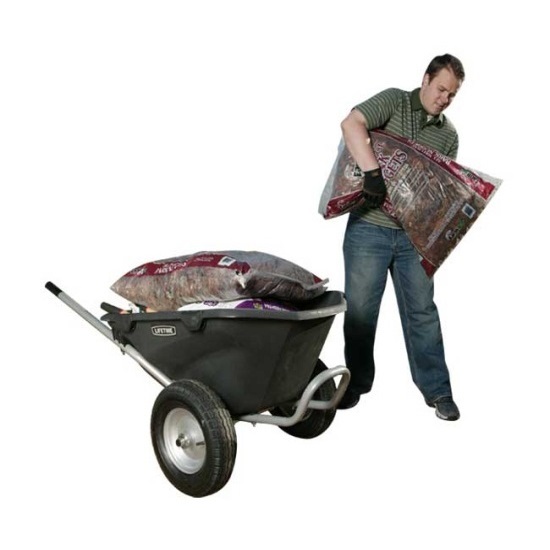 Wheels also provide the Lifetime wheelbarrow with increased ground clearance. Relatively shorter pivoting distances are required for better maneuverability in tight areas. Lifetime Products has been testing and improving on designs on many products and continues to offer new selection and better designs on many other items. Their commitment to constantly improve their products assures you a long life of use. Seems like a really sturdy wheelbarrow, easy to handle. (You really need two people to put it together). Can not wait to put it to good use. Price of wheel barrow was competitive and quality it high. there shipping and price is the best that I have seen along with their customer service is the BEST!!!!!!! My 13 year old son put this together mostly by himself; I helped him at the end. I have really enjoyed the ease of this wheelbarrow. The handles are metal and the grip is comfortable; no sliver opportunities. It was a well thought out design. I am much more efficient in my yard now! Gave as Xmas gift to my 71 year old mother to ease hauling firewood from pile to house. She loves it! Easy for her to maneuver and push when loaded up. It did take some time fiddling and fussing to get the tub bottom screws lined up thru handle flanges and wheel frame, definitely need 2 people to assemble. This wheelbarrow is very easy to use. I was moving gravel from front yard to the back. I was really amazed on how easy it was. construction of the product is solid. Worth every penny. I already researched the wheelbarrow before we purchased and this one found its way on every "best wheelbarrow" list. It does live up to the reviews. We purchased from Competitive Edge because they had the lowest price and shipped for free. Very FAST shipping. We received the item even before we received the email that it had been shipped!! I like that! Q: Where can I find a replacement tire for this unit? A: Please call 1-800-225-3865 for assistance. A: Why was the question not answered. It it another venue, please provide the information rather than a long wait for the appropriate department to answer the phone. Q: Is this advertised on TV as an 8 in 1 function wheel barrel? If so, what are the functions. Where is it sold? And what is the price? A: No, this is probably not the one you saw on television. We only sell this online through our website. Q: Can the average adult move this around with, say, full of mulch? A: Yes, the center of gravity is such that the wheels and axle weight really well. The average adult could move even heavier material such as sod. Fast Shipping: Orders for the 65034 Lifetime Wheelbarrow generally leave the warehouse the next business day. Dimensions: 41" x 28" x 16"